Queen Bat - ZineWiki - the history and culture of zines, independent media and the small press. 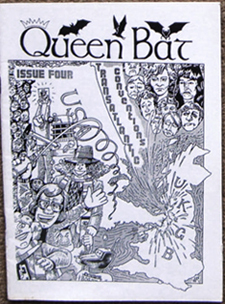 Queen Bat was a media science fiction fanzine by Jackie Marshall and Val Douglas published in Norfolk, UK. Previously known as Space Rat, the new title was solely devoted to the television series Doctor Who, and became much better known. Thirteen issues were published in the 1980s. Contributors of fiction writing included Nick Cooper, Paul Cornell, Martin Day, Clare Ford, Robert Franks, and the editors, among others. Contributors of articles included Audrey Baker, and Paul Cornell, among others. The Letters page was entitled '"Spectrox Nest". Paul Cornell's Doctor Who novel, "Timewyrm: Revelation", published by Virgin Publishing, was based on "Total Eclipse", a series written for Queen Bat. Several selections from Queen Bat, including "Creating A Role: The Doctor Who Girl" (Queen Bat # 6); "The Eternal Archetypes" by Val Douglas (Queen Bat # 5); and "Dear Auntie Nicer" by Jackie Marshall (Queen Bat # 13) are included in the 1997 fanzine anthology "Licence Denied: Rumblings from the Doctor Who Underground", edited by Paul Cornell and published by Virgin Books in 1997, which also included articles from fanzines such as Cottage Under Siege, and TARDIS, among others. This page was last modified on 7 February 2018, at 16:52.